Airbnb has a wealth of stunning places to rent. Using the site to hunt for a flat in Russia is a smart move for two reasons. Firstly, the prices are much cheaper than those of hotels offering accommodation of the same quality - and secondly, most of the hosts speak English (which is not common in Russia). RBTH has put together a guide to the best Airbnb apartments around the country. In the very center of Moscow, this small studio is a must for those who want to discover the heart of the capital on foot. The Kremlin and Red Square are visible from the window (they are just 7-9 minutes away), and it is just a 3-minute walk to the former Red October chocolate factory, with its trendy bars, fancy restaurants and modern art galleries. Balchug is a thriving and young-at-heart neighborhood: the place to be for clubbers, fashionistas and modern art freaks. The studio has everything for those who aren’t used to spending evenings at home. Otherwise, why come to Moscow? A 230-square-meter flat in the historic center of Petersburg is just as good a choice for a group of up to 10 guests as for individuals, who are free to rent separate rooms. Fifteen minutes’ walk from the Hermitage and 150 meters from St. Isaac’s Cathedral and the famous Neva River, this is an ideal spot to watch the bridges being raised during the White Nights of June and July. The host has almost 60 enthusiastic reviews on the website and is deeply enamored of the local architecture, history and culture. Prices are reasonable, and he also makes discounts for “architects, artists and academics”. By the way, this is not the only apartment he rents in St. Petersburg - look for cheaper options on his profile. 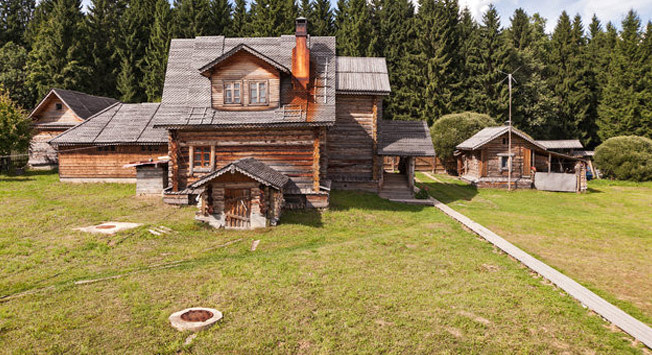 Is there anything better than staying in a wooden izba with Russian banya in a fir forest? Well, only staying in a bigger wooden izba. These are perfect for groups of 12-20 people in search of a ‘Russian’ weekend in Siberia. In spite of their traditional appearance, they all have Wi-Fi, parking, cable TV and other creature comforts. Going for a banya is a must during your Russian trip - you’ll definitely find some options in the city, but only in the village can you jump into a snowdrift afterwards or inhale clean air purified by fir trees. Here you may see two izbas , both located near the town of Sergiev Posad, a city which grew up around one of the greatest russian monasteries - Tritiny Lavra. The Russian Arctic is full of surprises for Airbnb users. First up , a camper and “field-office” in Kandalaksha. Joking apart, the landscapes are wonderful: the village is situated on the shores of the White Sea, and you can explore the Kola Peninsula “in comfort” (according to the profile). Second , cottages in Varguza. The host offers wilderness recreation in log cabins for four or six: drinking from freshwater springs, going on a true Russian off-road safari, spotting Beluga whales and grey seals in the White Sea, exploring an old amethyst mine and trout fishing. Third , a floating wooden house with banya for 10 people by an uninhabited island near the city of Arkhangelsk. The host mentions relatively few activities (mostly fishing), but the region itself has much to offer - villages with ancient wooden architecture, bucolic landscapes and the pristine waters of the Severnaya Dvina River. What is there to do in Nizhnevartovsk? Nothing in particular – you’ll probably go there for work (the city is known as the Oil Capital of Russia), or by accident. Anyway, don’t miss this truly European-style modern 1-bedroom apartment in the city center. A thousand kilometers to the south of Nizhnevartovsk - not far in this part of the world – is Omsk, Siberia’s second-largest city. With a historic core and a number of architectural monuments, the city of Dostoyevsky’s exile is an important spot for those interested in Siberian history. This cozy apartment in the city suburbs is available for an affordable price. If you decide to make the most of your Russian vacation and turn it into the trip of a lifetime, a journey on the Trans-Siberian Railway is a must. Stop off in Yekaterinburg, one of the largest cities on the route and an important industrial centre. Russia’s first city in Asia is more than just a place to break the journey – this is the place where the Romanov dynasty met its end in 1918. By booking this new fully-equipped apartment with balcony and park view in the city center you can visit Yekaterinburg’s main sights on foot and easily reach historical and natural monuments just outside the city. The bus stop is just a few minutes’ walk away. This cottage situated in Krasnaya Polyana is the place to be for those who will visit the resort once the Olympics are over. Relatively cheap compared to the resort hotels, this chalet for five is located in the very heart of Kransaya Polyana, with clubs, bars, restaurants and ski lifts just outside the door. On the top floor of a newly-built chalet, the apartment includes a large living room area, a built-in kitchen, two bedrooms, a whirlpool bath, and an impressive patio.